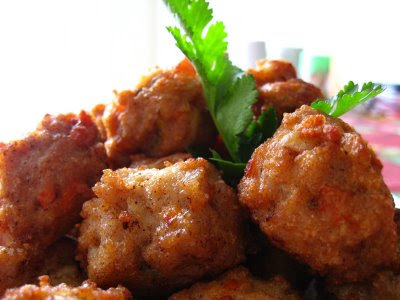 My friend Wendy raves about her Bubby Sookie's (Grandma's) famous, sweet and sour meatballs. It's now at the top of my list of things to cook this weekend. 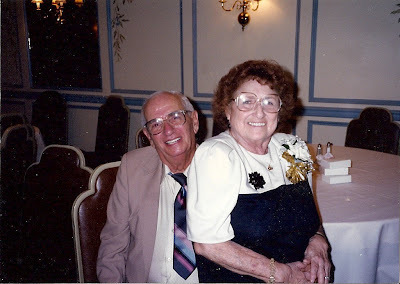 Check out a picture of the original chef (and her very happy husband) below! Bubby Sookies' Sweet and Sour Meatballs Secret Sauce You can use a stock pot on the stove or a crock pot. I usually use the crock pot if I am going to serve as an appetizer so everything stays nice and hot. 2 - 16 0z cans of jellied cranberry sauce for every 32 oz jar of Spaghetti Sauce (it doesn't matter what kind, I usually use whatever is on sale or whatever I have in the house.) Mix this up so they are really blended. Bubby's secret? Add a few ginger snaps to the sauce. (Break them up and let them dissolve.) Let the sauce heat until everything is dissolved, which will be about 30 minutes. Keep an eye on it, and stir occasionally if in a stock pot. If cooking in a slow cooker, you can put on high and leave it along for awhile. Now you are ready to make the meatballs. Meatballs 1 lb ground beef 1/4 cup uncooked rice (minute or long cooking, whatever you have) 1 egg 1 sm to med onion grated 1 carrot or a handful of baby carrot grated 1/2 tsp salt Mix all ingredients together. I add a little bit of the sauce into the meatballs for flavor. Brown the meatballs in a pan. Once the sauce is blended and really cooking, add the meatballs and let cook for another hour. Serve as an appetizer or over rice and carrots for dinner. Your house is going to smell amazing. *This recipe freezes really well!